"Through the Cities Connecting Children to Nature (CCCN) initiative, local officials across the country strive to create abundant access to nature for the benefit of the children and family in their cities. CCCN works with city leaders to confront pressing child development issues related to increasingly indoor lifestyles. These include higher rates of emotional and physical health challenges." Our Baltimore CCCN Implementation Plan focuses on confronting the marked disparities in access to nature that run along economic and racial lines. For the greatest impact, it is crucial that city leaders hold equitable access to nature for all their residents as the first and foremost tenet of their efforts. The first step has been an inter-city agency task force to create a Baltimore focused Children's Outdoor Bill of Rights that will be launched in May 2019. To join this effort and move our Baltimore Implementation Plan strategies forward, please contact Mary Hardcastle at [email protected]. 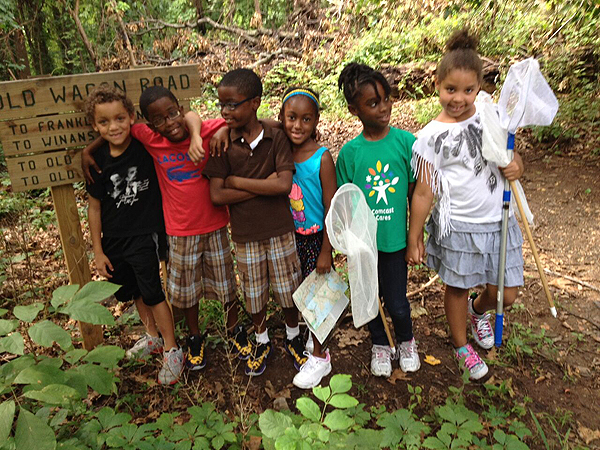 The Greater Baltimore Children and Nature Collaborative (GBCAN) is an initiative of Baltimore City Recreation and Parks. GBCAN encourages partnerships and provides information to foster caring relationships with nature. Recognizing that nature connections are important for everyone (children and adults), members of this collaborative believe the health and well being of children need special guidance and attention. Baltimore City Recreation and Parks, Baltimore City Office of Sustainability, Baltimore Green Maps, Blue Water Baltimore, Chesapeake Center for Youth Development, Friends of Gwynns Falls/Leakin Park, Friends of Herring Run Parks, Greater Baltimore Wilderness Coalition, MD Chapter American Academy of Pediatrics, Natural History Society of Maryland, Nature Art in the Park, Parks & People Foundation, Y of Central MD. • Access—To engage and connect to nature, children and adults need access to information, resources and developmentally appropriate activities. In 2013, Baltimore City Recreation and Parks adopted GBCAN as an initiative because we believe in the importance of nature connections. GBCAN activities support our “Get Active and Stay Healthy” campaign by encouraging children and their families to connect to nature in city parks. Spending time in nature can foster a child’s sense of self as well as a sense of place in the community. 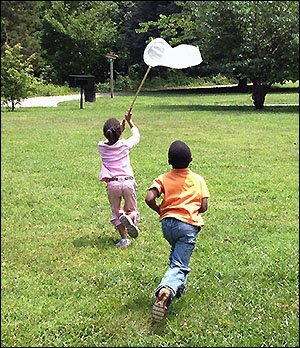 Playing in nature creates fond memories and helps children learn about their world. Not only does it make your kids (and you!) happier, healthier, and smarter, it’s great for family bonding and easy on the pocketbook. Become a member of GBCAN and participate in this growing community! Membership is free. Join a GBCAN workshop. We know that getting nature on your calendar can be a daunting task, and we’re here to help. In our engaging, hands-on workshop, you’ll learn about research supporting the movement to connect kids and families with nature, while you learn about common fears and obstacles to getting out in nature. You’ll discover your own barriers, and ways to overcome them. You’ll learn specific ways to encourage, support, and enhance your children’s outdoor experiences. For more information on the forum and GBCAN, contact Mary Hardcastle at BCRP or call 410-396-7020. You can also follow GBCAN on Facebook.